It is parliamentary election season in Singapore now and there are several firsts this round. The most significant to me personally are that I will finally get a chance to vote, and that there is an infectious diseases physician contesting this time as a candidate for the Singapore Democratic Party (SDP), one of the older opposition political parties in Singapore. 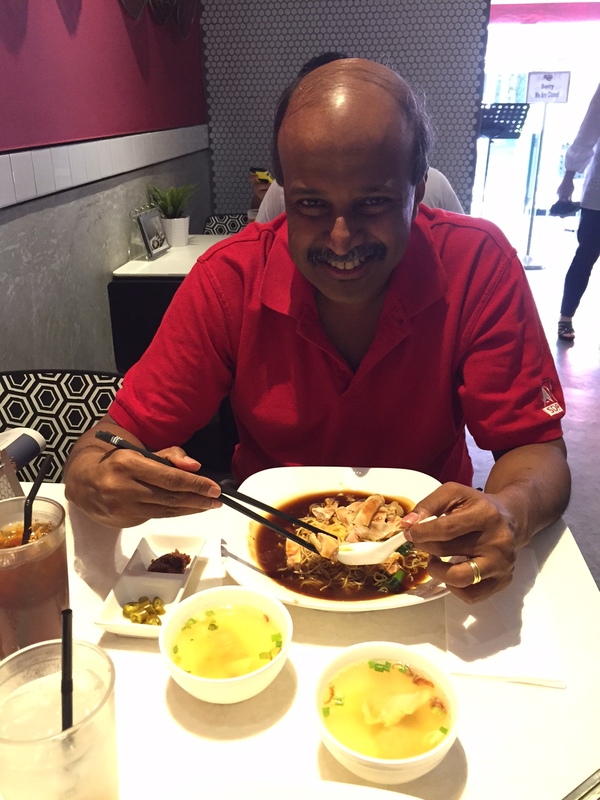 Prof. Paul Tambyah having chicken ipoh hor fun at a well known Holland Village restaurant. Professor Paul Tambyah is famous in medical and healthcare circles, although perhaps less well known to the man or woman in the street. He was the founding head of infectious diseases at the National University Hospital, and has won more awards than I can count. He is regularly invited to give lectures at international conferences, and sits on a huge number of ministry (not just MOH) committees, lending his insights and experience to improve Singapore. I have the privilege of working under, and then with him, for a good number of years on both medical and other matters. His intelligence is quite evident, and is combined with great energy and a deep sense of integrity. Less well known is his compassion, which I have witnessed exhibited to medical students and patients. Unlike many others, he still maintains a faith in Singapore, and a willingness to freely contribute his time and energy to Singapore that is striking. There is no profit – personal or otherwise – that comes from being associated with the opposition in Singapore, as many locals know. Why did you – a prominent infectious diseases clinician, tenured professor of medicine, well-respected researcher, and a happily married man – decide to get involved in politics in Singapore? The main reason was the frustration with the healthcare financing system in place in our public hospitals. Many doctors and nurses feel the same. I have tried all the conventional approaches including speaking up at various feedback sessions etc. but to no avail. Eventually I realised that the only way to get answers on important questions is to get into parliament. One of my heroes Rudolf Virchow did the same – and he was contending with Bismarck the Iron Chancellor! Many of your colleagues are concerned about your being in an opposition party. That you may suffer job repercussions, loss of career opportunities, and not be awarded further research grants post GE-2015. What do you say to that? How did you persuade your wife and family to let you campaign? It was hard. They were very worried about repercussions – my parents knew Dr. Lim Hock Siew and Dr. Beatrice Chen very well and obviously 20 years of detention without trial was a scary spectre. I think that the realisation that with social media, those kinds of things will never happen again hopefully helped reassure them. My wife knows that she cannot change my mind once my mind is made up :-). Hopefully not any more. Many doctors and nurses have been spotted at rallies and so far, all are well! 5. What 3 things do your medical colleagues not know about you? 1) that I have a second edition of Osler’s Principles and Practices of Medicine from around 1900. 2) that I cannot drink coffee after 3pm. 3) that I was once one of the editors of Sintercom – the Singapore Internet Community (that was) shut down before the 2001 elections. What is your favourite hawker food and is it really healthy to eat orh luak (what are the risks of hepatitis or food poisoning)? Why should people vote for someone like you – who hails from another ivory tower (i.e. university)? I like to think that my general medicine duties bring me back down to “the ground”. My mother’s favourite quotation is from Proverbs 31 where she talks about being the “voice of the voiceless” in speaking up for the marginalised who are often sidelined. I hope that I can be part of that voice in parliament.